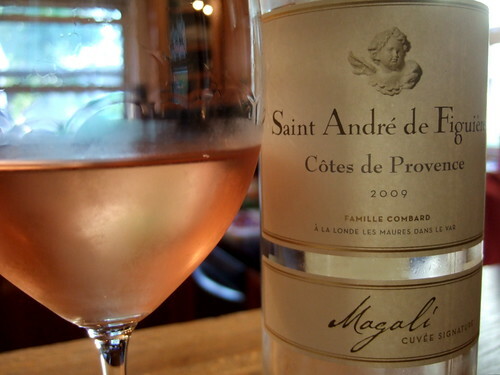 Saint André de Figuière, Côtes de Provence, Magali Rosé (cuvée signature), 2009. The “signature” wines being each named after one of “the three children of the estate.” 25% Grenache, 15% Cinsault, 30% Syrah, 30% Cabernet. Note the bottle is empty. Tonight, mild and fresh air, the last light of a lovely June evening. I sit at our kitchen bar shelling fresh peas for dinner and sipping this lovely rosé. The color is a salmon sunset; the nose is strawberries mixed with clean wet stones. The wine sips berry fruity at first and then finishes long, dry, and citrus tart (Pamplemousse!). Delicious. I welcome a chance to drink more this summer. The Domaine Saint André de Figuière website has a section, “La Dégustation,” or as they translate it: “Let’s Be Gourmet,” which makes me think of Japlish t-shirts and handbags, “Let’s Cooking!” In any case, some recipes to go with their wines (in French). Ahh, as much as I enjoy your sake posts it is not something I know anything about. Rosé, on the other hand, I drink routinely. I will try this one. Nothing speaks summer like a cold, crisp rosé!